Charles E Hires began the manufacture of a "root beer extract" in Philadelphia at the Centennial Exposition. The Crystal Bottling Company began bottling HIRES in 1893. The most famous and collectible of the root beers, Hires collectibles break down into three categories: Hires Extract (from 1876), for home use, and Hires cures, cough cures, condensed milk, etc. 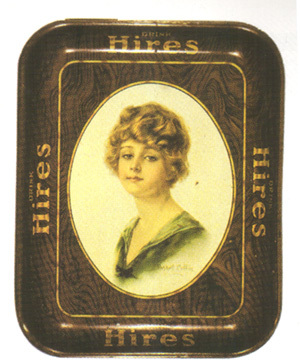 All areas have produced a wealth of advertising for collectors: trade cards, die cuts, extract bottles, syrup bottles, syrup dispensers, tin and porcelain signs, early calendars and early serving trays, mugs as well as a variety of ceramic dispensers. Hires is available for order at The Soda Shop. The Charles E. Hires Co. Philadelphia PA.
"The Old-time Flavor Made by Hires Since 1876"